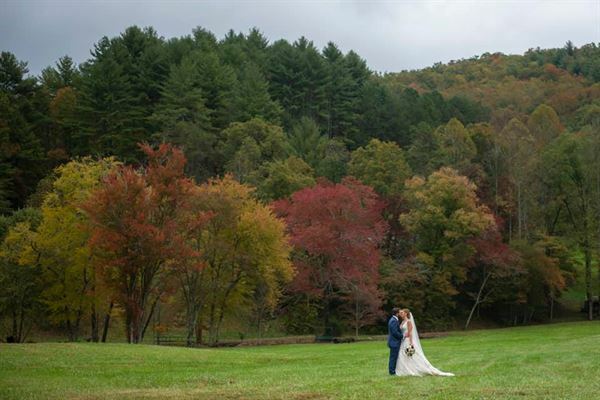 Located near the Great Smoky Mountains in western North Carolina, Covered Bridge Farms offers a gorgeous site for romantic weddings in a natural setting. While the Covered Bridge is a favorite site among brides, there are several equally stunning spots from which to say your "I do's." Verdant pastures, manicured gardens, boldly-flowing creek, restful gazebo overlooking a spring-fed pond, and stunning mountain vistas can all be a part of your special day. This is our most popular package. It includes the following: Exclusive use of the grounds for your rehearsal, ceremony, and reception; access the day before for decorations to be set up; electric service at both bridges, the gazebo, and the Rockface Garden; trash receptacles; on-site host to help guide your vendors to their designated spaces; use of the Bridal Suite and Groom's Quarters; grounds clean-up following the event; tables, chairs, linens (including set-up and take-down); pre- and post-wedding photo privileges at the estate. Our deluxe package includes all the services of the standard package, with the addition of full or partial planning services, and day-of coordination of the wedding. Contact us for pricing, as this package is customized according to event size and personal requests of the client. North Grove Hall is a charming cottage venue for all your events needs. We specialize in rehearsal dinners accommodating up to 50 guests. We are ideal for private parties, corporate events, elopements, intimate weddings, baby and bridal showers. We offer full service for any event but also allow you the option to do-it-yourself. Ask about our catering menu. The Venue at Farris is North Georgia’s newest event center, located in Lumpkin County just north of the North GA Premium Outlets. We are nestled in a peaceful, serene country setting in the Appalachian Foothills. The Venue is a relaxed environment perfect for your; Holiday Parties, Showers, Quinceaneras/Sweet 16 Parties, Weddings, etcetera. We offer a spacious Banquet Reception Hall which is 3,500 sqft ensuring your event is the only event onsite. We also now offer a smaller, more intimate setting for showers and groups of 25 or less. Appalachia Event space rental’s offers a unique venue for your next meeting or special event. Whether you're hosting a party, social gathering, office meetings, holiday gathering, special occasions or even a wedding, our beautiful 'event space’ are perfect anytime people come together. When you want comfort, beauty, convenience and affordability for your events, look no further, contact us for more details. We take pride in making any type of event a wonderfully memorable experience.